Would you like designer custom bevels in your kitchen cabinet doors, or need a window or panel that gives privacy & beauty but still gives light? 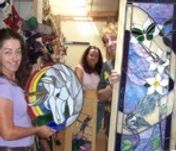 Are you renting a place and love stained glass for atmosphere? Then there is an answer with custom made panels, all you need is the size of the window, visit the shop, bring in your ideas or browse through a library of books - there are over 2000 designs to pick from and Sunlight Studio specializes in stained glass Australian birds/wildlife both in colour & bevels. There is also a range of stock bevels & bevel clusters available which in themselves can turn nice leadlight into a quality up market panels without a huge increase in cost. Detailed flora, fauna & fish panels can be designed for doors, windows, side lights and transoms. For enquiries please use the contact box in the information bar, upper right. cyber space for no apparent reason, or a public holiday or a weekend I'm away. but give it a couple of days ... just in case, and I will get back to you asap. 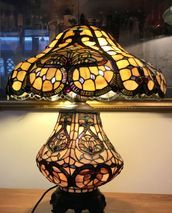 Finally, if you would like to stylize your home or have a special need for art deco cinema style lights, Australian flora/fauna, birds, fish, fan lights or lamp shades but can't find what you want here or elsewhere. Then we can make it.